All youth classes put on great displays of race craft at the third and fourth rounds of the 2019 Arenacross Tour in front of a combined audience of over 10,000 at The Resorts World Arena, NEC, Birmingham, last weekend. In the opening race of the third round on Friday, new faces at the top of the 65cc Youth Cup kept things interesting with youngsters Isaac Ash and Jamie Keith finishing ahead of Belfast winner Zane Stephens. The other Belfast winner, Freddie Bartlett, didn’t get the result he anticipated. His charge was brought to an abrupt halt on the opening lap when a tuff bloc covering wrapped itself around his rear wheel, locking it and finishing his race. In the evening’s second race, Bartlett made a stunning comeback to win by over six seconds ahead of overall winner Ash and new championship leader Stephens. Raife Broadley returned to the top in the Team Green Supermini Cup first moto, taking the win some three seconds ahead of Ethan Sills with Tom Harris continuing to show consistency in third. Arenacross regulars in previous years, Tye Jones and Ezra Blackwell stepped into the breach when Hudson Roper and Wal Beaney were ruled out of the weekend due to injury. In race two, Broadley put in a blinding last turn move on Sills to take a double-moto win and claw back the championship lead from Alfie Jones. Jaygo Beasty took his first podium of the Tour in third. The Rookie Cup was bolstered for the weekend’s double-header with the introduction of three new riders adding a European flavour to the group in the form of Frenchman Axel Boldrini, German Max Lausch and the UK’s Preston Williams. Series leader Ben Clayton took the Friday afternoon win ahead of Adam Collings and Josh Greedy. Clayton was again unstoppable when it came to the public show. He ended the round cleaning up in every session to take the class overall, and extend his championship lead to 86 points ahead of Greedy on 70 points. The fourth round of Arenacross provided plenty of action with riders across all classes gunning for glory. In the youngest group, nine-year-old Bartlett moved on from yesterday’s spate of bad luck to take the seven-lap win in convincing style. Series leader Stephens finished second and an on-form Keith, now recovered from his Belfast injury, enjoyed another well-deserved podium finish in third. In the second race, Stephens shot off the start grid and was first into the corner, he held Bartlett at bay for one lap but, once the Yamaha rider was through he never looked back, pulling away from the pack lap after lap. Stephens finished second in the race and Keith showed strong consistency by taking another third place. It was a good night for young Lewis Spratt who travelled across from Northern Ireland. He was the sole 65cc rider to take part in the opening ceremony when he joined Glenn McCormick as Team Northern Ireland, that clearly boosted his confidence as he then went on to take fifth and sixth place finishes and fifth overall on the night. 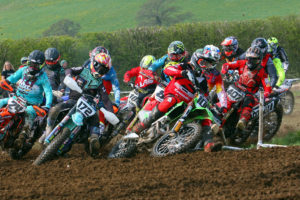 Clayton again proved he’s the one to beat in the Rookies with a healthy margin over recent Rookie signing Williams – the 2015 Arencross SW85 runner-up – and Collings in third. There was no stopping the Devonshire lad in the final race of the day; he again took a flag-to-flag win leaving Collings and Williams to battle it out behind him. Gilbert and Banks-Browne rewarded big time by Bridgestone!